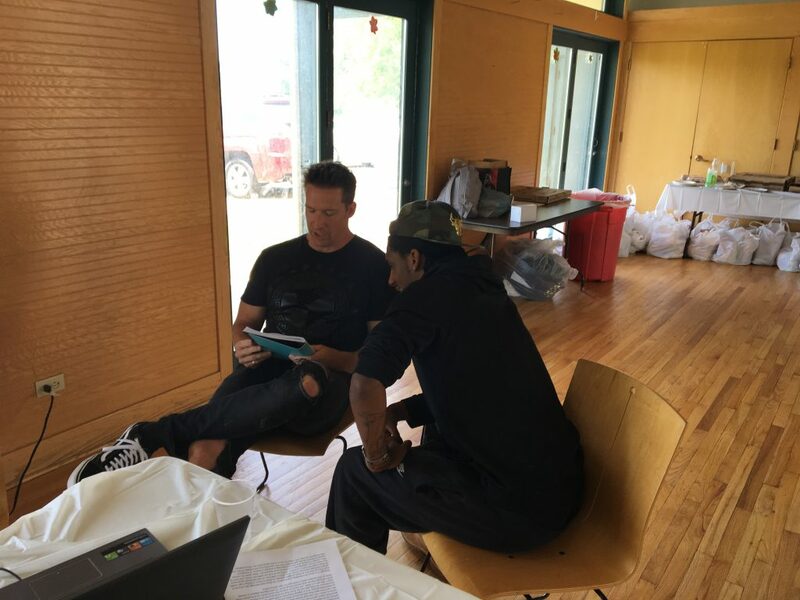 Zach Filkins of OneRepublic was happy to share the good life of the music industry with teens at the Lockport Village this past June. The award-winning musician hosted a lunch and music video program for a group of 10 youth. At first, the teens were a bit star-struck, but soon warmed to their new rock star friend. The music video workshop included Filkins showing examples of his favorite music videos and describing the process of creating a music video “treatment” – a visual representation of the components of a music video, such as graphic elements, mood, characters, etc. During this time, Filkins shared hard copies of OneRepublic’s treatment for their new song “Start Again.” The teens then broke into small groups and used laptops to research and create a treatment for a favorite song. Filkins visited with each group to discuss their ideas. During this time, one of the older teens wrote a poem and talked about the process of making music, while several other teens shared stories about the ways that music has helped them to feel strong in difficult times. Filkins related to their comments, and shared that music gave him a much-needed outlet as a teenager for expressing emotions and working through his problems. This process of creating treatments offered our teens the chance to share personal sentiments, express themselves, and feel pride in their work. We are grateful for the ongoing support of Zach and Lindsay Filkins for the last few years. Earlier this year, after touring the Chicago and Roosevelt Square Villages, Filkins had the chance to meet several Foster Parents and children. He expressed how important family is, as well as creating opportunities for children to thrive. Additionally, the Filkins attended Dining & Conversation, our spring gala, in May 2018, and were recognized as special guests. As a member of OneRepubic, Filkins is no stranger to philanthropy. The OneRepublic Good Life Foundation is dedicated to the idea that regardless of the family, city, country, or economic environment a person is born into, they deserve the right to live a good life. SOS Illinois prioritizes the health and wellness of the children in its care. In particular, the mental health of children and youth are addressed by a team of on- and off-site clinicians who support ongoing trauma-informed therapy. Creative mediums, such as the type of workshop led by Filkins, can be a healing experience for our children and youth, many which are navigating previous traumas. We are thankful for the ways that the music industry, as well as visual and audio artists, can support the healing process for those in foster care. Are you interested in giving our community the gift of your artistic skills? We welcome volunteers to lead art, music, and expression programs throughout the year. Contact us to let us know how you would like to be involved, and read more about our clinical team and promotion of mental health awareness at SOS Illinois.